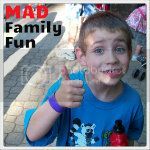 MAD Family Fun: How much fun can you have for $2.52? Time and time again I tell people, it doesn't take a lot of money to have fun. It really doesn't! And to prove my point, I am going to show you what we did this past Saturday and it cost us a just $2.52.!!! Our first stop for fun was at Lowe's Build and Grow Clinic. I have mentioned this before (like a million times) but I will say it again because this is a great program. 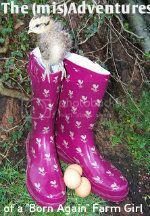 The clinics are FREE and run about every two week on Saturdays at 10am. Children get to build great things like this Monster Box the oldest Fun Tester made this week. Children get an apron and for each thing they build, a patch to put on the apron. They also receive a certificate and get to take home their project at NO COST. How can you beat it!?!? Our second stop of the day was at Michael's craft store for their Make It, Take It event. This event cost us 52 cents to purchase a pail (which was on sale.) The children cut out designs from duct tape with the help of stencils to create their own trick or treat bucket! How neat is that? The Fun Tester made a face on one side and a bat on the other. These events are either free or with a purchase which always seems to be a low cost item. Our final stop of the day was at an event called Spooky Science Saturday. It was being held jointly at the Children's Garden and the Kingman Museum. They had all sorts of education (science) activities set up. The Fun Tester had a wonderful time learning about surface tension, making animal tracks, learning about the technology that led to modern films and much more! It was all hands on and he had a wonderful time. The cost of this event was free but they were asking for a $1 donation per person. $2 for all that fun and learning was a steal. Not to mention, the next day in the paper was the Fun Tester's photo!!! Now there is a memory he will have forever. See, having fun does NOT have to cost a lot. And finding events doesn't have to be impossible either. Check out our Cruise Directing 101 to learn how to find events. Now get out there and find some fun! !